What is Acquired Adult Flat Foot?... How to help your patients avoid catastrophic foot surgery. Don't miss this flat foot condition in your patients... with tips on how to recognise it. Flat feet don't usually hurt, especially in children. But if you notice a one-sided, worsening, painful flat foot in an adult, think.... Acquired Adult Flat Foot!! Usual age- 45 to 65, women 4x more likely to get. Risk increased with diabetes, hypertension, and obesity. This is not a condition to be complacent with! Depending on the stage of deformity, different degrees of immobilisation, orthotic support, and rehabilitation therapies will be needed. Physio's take note- these patients always will need custom orthotic therapy. Do NOT give heel raise exercises and cross your fingers and hope for the best! It will get worse, they will not be happy with you, and they will need a more corrective orthotic and possibly surgery. At Pioneer Podiatry (here's the plug...) we specialise in treating this condition, including custom AFOs which are very effective in treating this condition. The good news is about 50% of all AAFF patients treated with custom AFOs are symptom free after 12 months, and can often go without the brace for most activities. This article is really a very brief overview, so if you've got a hankering for the details of how to assess and treat this condition, have a squizz over at our Clinical Practice Guideline in our Referrers Portal. It's free, instant assess to clinical tests with video demonstrations, patient handouts for this condition, and treatment protocols to help you give the best treatment and advice to your beloved patients. Find it here. Have a great day! Keep being awesome. Plantar plate not feeling so great? What is the plantar plate? Isn’t that the thing you put under your pot plants to catch the water? Well, NO! It’s way more interesting than that, and it’s probably the most underdiagnosed cause of forefoot pain in most primary care clinics. The plantar plate is the fibrocartilagenous thickening of the metatarsophalangeal joint, under the foot, just behind the toes. It is a complicated little piece of anatomy, which needs to do several big jobs at different stages in the gait (walking) cycle. If you’re interested, this includes enabling the windlass mechanism of the foot to engage and resist medial arch collapse in mid stance and propulsion. If that doesn’t make sense, I want you to remember just one thing… it attaches to and is made from the same fibres as the plantar fasciia. This is a big deal, and I’ll explain why later. Normally, pain right in the area just under the 2nd toe joint (2nd MPJ). Often your patient will describe a feeling of swelling under this area, like walking on a lump. If it’s recent and severe, you’ll see swelling in the forefoot and toe, and often an immediate wonky toe (not a technical term!). To demonstrate this wonky toe effect, get them to stand barefoot. If there is excessive space immediately obvious between the 2nd, 3rd or 4th toes, think plantar plate tear. One trick- your patient may complain of neural type symptoms (burning, numbness etc) in the affected toe. This is due to localised swelling annoying the intermetatarsal nerve. You might be tempted to think it’s a mortons neuroma. Don’t be tricked by this one! Grab the toe and dorsiflex it (point it up towards the roof, if they’re sitting!). This will aggravate an acute tear. There is also a test called the modified Lachmans test, when the toe is dorsally translocated (pulled upwards, again, in a sitting/ supine patient). If it moves more than 2mm/ 50%- think plantar plate tear. Also, the wonky toe sign when standing, which I mentioned before. Now- what does this injury have to do with plantar fasciitis? In short, they very often occur together, because whatever increasing stress in the plantar fasciia immediatly has to increase stress in the plantar plate. Anatomically, the plantar plate IS part of the plantar fasciia. So, if you see one, look for the other. Straight away, icing (first 3 days in acute/ athletic cases), NSAIDs, and some relative rest to reduce tissue stress to the joint. Moon boots and cam walkers are a great option first 3-4 weeks. Strapping to assist plantar flexion of the toe can be fantastically successful for some. Flexible tapes, such as Rock tape/ Kinetic tape, are the best for this. Longer term, you need to reduce the tissue stress to allow normal gait and reduce re-injury. Orthotic therapy is very useful, as long as it’s done right. Us podiatrist get excited by this, and we’ll throw around words like plantar metatarsal pads and accommodations, anterior orthotic edge lengthening, and extrinsic forefoot posting. If you’re still awake and reading this, WELL DONE! SO, what if this doesn’t work? Primary surgical repair is an option, along with tendon transfer. Sometimes a judicial cortisone injection in the extra-articular space can help a lot too. 1. Yu GV, Judge MS, Hudson JR, Seidelmann FE. Predislocation Syndrome. JAPMA. 2002;92;182-199. 2. Keir R, Abrahamian H, Caminear D, et al. 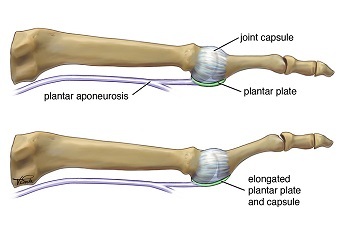 MR Arthrography of the Second and Third Metatarsophalangeal Joints for the Detection of Tears of Plantar Plate and Joint Capsule. AJR. 2010;194;1079-1081. Sore feet after beach holidays? Why!? It's just so tempting! Beautiful long summer afternoons, and so many amazing beaches to choose from. Who doesn't love a nice long walk to feel the sand between your toes? Or maybe you're making the long trek at low tide to catch yourself a flathead or two! But what do you do when you find yourself suffering with pain when walking, or perhaps the next day? Is the pleasure worth the pain!? Many people complain of painful heels and sore aching feet after spending a relaxing weekend at the beach, so you are not alone. If your foot and heel pain improves each day with a bit of rest and some good footwear choices, then you are probably out of the woods. If it doesn't go away, you have two options. Either walk around in pain for weeks or months (or years). Or you could come and see us for some professional treatment and advice. Depending on how long you have had your pain, the severity of your pain, which structures are injured, and your daily activities, your treatment could range from some basic strengthening, stretching and taping techniques, all the way through to custom orthotic therapy, and more specialised therapies. One word of advice- the longer you leave it, the longer it will take to get better. The sooner we can fix it, the sooner you can get back to normal walking without pain. Sounds good? I bet! Are expensive shoes worth the extra money? It’s a question we get all the time, and a question I love to hear from my patients! To put it simply, spending a few dollars extra on your shoes could be the best bang-for-your-buck to fix your sore feet issues. Aren’t they all made in China anyway? The activity you will be using them for. There is no ideal shoe. Just like there is no ideal foot! You need to match your foot with the activity you’ll be doing, with the right footwear. Running 15ks a week is very different from running 5ks, or 50ks! And distance running is very different from other sports like netball, tennis, hockey, basketball, and will require shoes that can handle these differences. Ok. This one is tricky. Particularly with the ladies. Remember the rule- if you wear the right shoes, at the right time, for the right activities, you will be ok! But this does mean there are wrong times to wear certain shoes (e.g. thongs for mowing the lawn), and there are right times to wear the wrong shoes (e.g. 3 inch stillettos to a wedding). As a general rule, you need to have footwear that will reduce stress and strain to your feet at the times when you stress and strain them the most. Just think- when do your feet hurt most right now? Is it after walking the dog for half an hour in your thongs? Or when you mow the lawn in your worn out sneakers? Or when you stand all day in your ballet flats in your retail job? Buy a shoe only for its colour, brand, price, etc. The benefit of a well-fitting and correctly designed shoe will last a lot longer than the thrill of a bargain that doesn’t fit, or doesn’t suit your foot and makes it hurt. Try and make your running shoes last forever! 6 to 12 months and you really should be getting new ones, depending on what you do in them. Wear the wrong shoes for the activity you’re doing. Get a shoe that feels good in the shop. If it doesn’t feel good on your foot in the shop, it won’t feel good after walking/ running for 5ks, that’s for sure. Get your feet measured! Heaps of people are in shoes that just don’t fit. Get help if you’ve got problem feet. Find a good shoe shop that can measure and fit you professionally. See a podiatrist if you’re in pain. That’s what we do- fix sore feet! Consider video gait analysis. This is where we film you walking or running, and evaluate your footwear and orthotic needs. These suggestions are of course very general, and will suit most people most of the time. If you're having trouble with getting footwear, or having persistant foot or leg pain, come and see us for a thorough evaluation of your injuries. We're here to get you out of pain, and back to normal again! Have you heard of the latest medication you can take daily to treat these conditions? Reduce mortality and the risk of recurrent breast cancer by approximately 50%. Lower the risk of colon cancer by over 60%. Reduce the risk of the development of Alzheimer’s disease by approximately 40%. Reduce the incidence of heart disease and high blood pressure by approximately 40%. Lower the risk of stroke by 27%. Be twice as effective in treating type II diabetes than the standard insulin prescription and can save $2250 per person per year when compared to the cost of standard drug treatment. Can decrease depression as effectively as Prozac or behavioural therapy. Did you also know it is being offered for free? And it can be taken any time of day, with no side effects? Organised excercise i.e. gym, walking groups, tai chi. Pretty much anything, as long as you're moving your body around the place! If you are suffering from any chronic diseases, chances are you'll benefit greatly from a daily dose of exercise. Did you know there are health specialists trained to dispense you the perfect dose? Exercise Physiologists (EPs for short) can show you how to best approach this for your needs, so you get the best results possible, without any problems along the way. For more information on EPs, visit www.essa.org.au . At Pioneer Podiatry, we always encourage Exercise as Medicine. If you are having foot or leg problems which are preventing you from taking your daily dose of exercise, please come in to see us! We can give customised footwear prescriptions, and make custom orthotics to ensure your feet and legs are working properly for the activities you love to do. Read our article for the local "Healthy Fit" Magazine. So you’ve been turning up the heat in your training and you noticed a niggling ache in your knee. Or maybe you're finding yourself dreading the thought of walking the length of the shopping centre as you know how sore you're feet are going to be by the end? “Finding someone you can trust and who understands your goals is part of a successful patient- doctor relationship”, says Phil Marshman, owner and practice principle of Pioneer Podiatry. As a long-time resident of the Mackay area with an interest in living a healthy lifestyle, Phil knows the rewards and challenges that come with pushing yourself in the pursuit of fitness. "This time of year I tend to see those people training for the numerous sports events on the local calendar, such as the Mackay Marina Run, as well as those participating in the sports leagues that start getting serious around this time. Once you start pushing yourself, your likelihood of injury is drastically increased. And when you do, you need to make sure you've got the right team of health professionals you can trust to play their parts in getting you back on track." Podiatrists are university trained from day one of their education to specialise in the diagnosis and treatment of foot and leg injuries. However the value of this specialisation is best seen when working within a medical and training team. "When I work alongside the many doctors and therapists in my network, we all understand our strengths and limitations. I might know all about how and why your foot is sore, but I'm also looking for cues that tell me you'll need help from another therapist. It's all about getting the right people on the job at the right time for the best result for you." The study of human movement and locomotion is a science called biomechanics, and this field of study is of particular interest to Mr Marshman, as he has equipped his clinics with advanced equipment for high speed gait analysis and 3D optical foot scanners for orthotic design. When it comes to orthotic materials, Phil says the options are limitless. "I have patients often ask me, 'Do you make hard orthotics or soft orthotics?'. For me, it always depends on what we are trying to achieve. Some people need a harder orthotic to fix their problem, and others will need softer ones, however I will always make sure they are comfortable and are suitable for the kinds of footwear you like to wear. If you're not happy, I'm not happy." At Pioneer Podiatry, we stack a range of premium footwear to accomodate orthotic therapy. Our range of sandals is getting better each year. Previously, they range was limited to fairly bulky styles. Now we are finding much more popular designs, with thinner straps, and better colours. To see our range, and to try them on for yourself, we have stock on site at both our Northern Beaches and Sarina clinics.